HELPING HANDS: Among those who took part in Sunday’s presentation of items that will help homeless veterans transition into independent living are, from left, Maria Zaharakos, Dr. William Carr, Marianne Phehlan, Albin J. Joiner, Georgia Pappas, the Rev. Andrew George, Josie Aliferakis, and Karen Drager. Words both celebratory and somber filtered through the public address system Sunday inside the Rev. Peter G. Mihailides Center on Cranston. They were all part of a heartwarming “thank you” acceptance speech from Albin J. Joiner, a peer support specialist for the U.S. Department of Veterans Affairs who works out of the VA Medical Center’s campus in Providence. 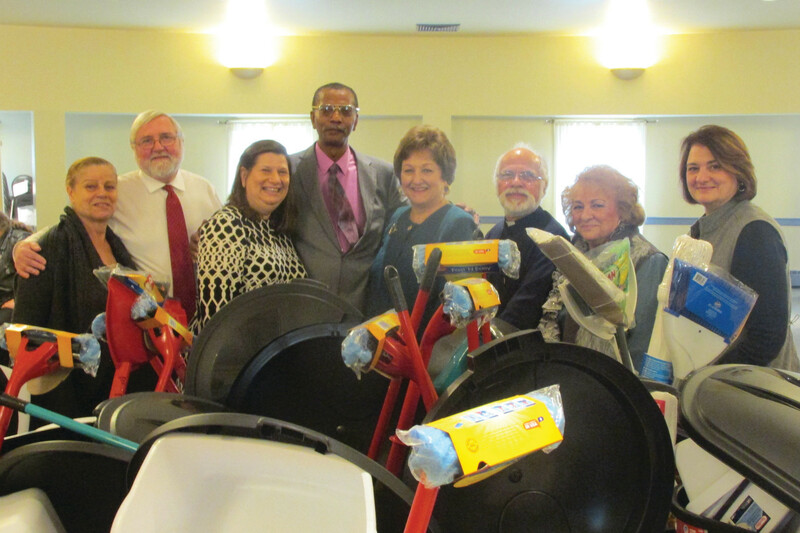 Joiner, you see, came to the Church of the Annunciation with Dr. William Carr from the VA, which Sunday received 25 rubberized barrels that were over-flowing with items like brooms, dust pans, and laundry detergent. After Carr said “thank you” to the Greek Orthodox parish’s Ladies Philoptochos Society for “this extraordinary donation,” Joiner took center stage and delivered a powerful and informative speech on what homeless veterans suffer through after serving their country in combat and returning to civilian life. Joiner told how he served in combat with the U.S. Marine Corps in 1971-72 in Phnom Penh, and upon his discharge found himself homeless. Now, his main mission is to prevent other men and women from going through a similar ordeal. “The entire Greek Orthodox Metropolis of Boston is undertaking this mission to assist those homeless veterans,” said Georgia Pappas, president of the Ladies Philoptochos Society. For the Cranston chapter’s donation, 25 different members donated $100 for each barrel and its contents, and did so in many cases in memory of loved ones who also served in various branches of the armed forces.